I started test fitting for reassembly and have run into a puzzler that I hope I can get some advice on. The first two photos below show a 3mm space that I am not sure if I should shim to close up. The third photo shows how the crush washer orients in the oil cup. The race, bearings, race, felt washer, and crush washer are oriented as they were when I opened the fan up. And just as a reminder - these photos show the unit upside down. Once I tighten the oil cup down and flip the fan over to its running position, the rotor should slide down by that 3mm (or however much space is left after the crush washer mushrooms over towards the felt washer). The way you see everything right now - the rotor is aligned perfectly with the stator. If I don't add any spacer the rotor will drop out of alignment by that 3mm or less space. That may possibly be preferred since the rotor is presently touching the top casting/bushing in this upside down orientation. 1. Leave everything as it is can continue with reassembly. 2. Add a 1mm or so shim between the rotor casting and first bearing race. That would keep the rotor/stator a bit better aligned. 3. Add a shim between the bottom race and the felt washer - same outcome as question 2, I guess. Answers to these questions would pretty much get me back to work, but the following questions I have been made aware of by reading this fan forum. A. I remember reading that the felt washer may need to between the top race and the rotor for vibration dampening instead of what is shown in my photos. Maybe add an additional felt washer would help? B. In Scotty MacClymonds' Ceiling Fan Lubricating paper he advises "place a piece of rubber under the bottom bearing race." I am liking Scotty's idea. Maybe replace the felt washer with a bit thicker piece of rubber, reassemble and see what happens??? I don’t know what that copper things is. I’ve never seen one on any fan before. Pull it, and I bet you are fine. Steve Cunningham wrote: I don’t know what that copper things is. I’ve never seen one on any fan before. Pull it, and I bet you are fine. Well, it is a crush washer. Often used for sealing in oil bath applications, I have read. Since there was one present when I disassembled, I replaced it with a new one. The old one was horribly mangled - as you see it is nothing like a tight fit. All in all I was convinced that it should be there, due to the space between the threads and the broader shoulder of the shaft. I measured the recess in the bottom of the oil cup, and lol, there's the 3mm. Thanks for the heads up Steve!!! Make sure when you reassemble to put a thread sealant on the shaft threads. Pat Murphy wrote: Hi All ! Hi Pat. That looks like a nice restoration you're working on there! I realize that the rotor may appear "aligned with" the stator with the fan upside down, but I have a feeling it would be sticking out further on the bottom than the top. 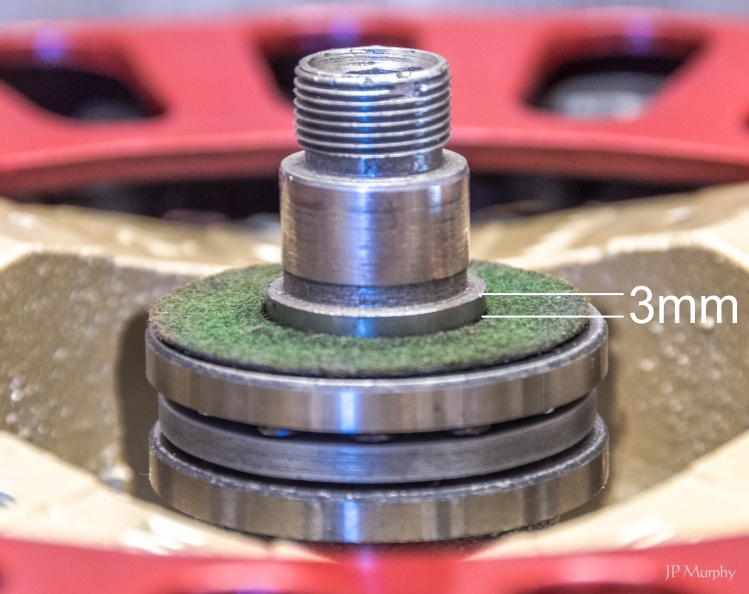 The rotor has a small area at each end which is more-or-less inactive. 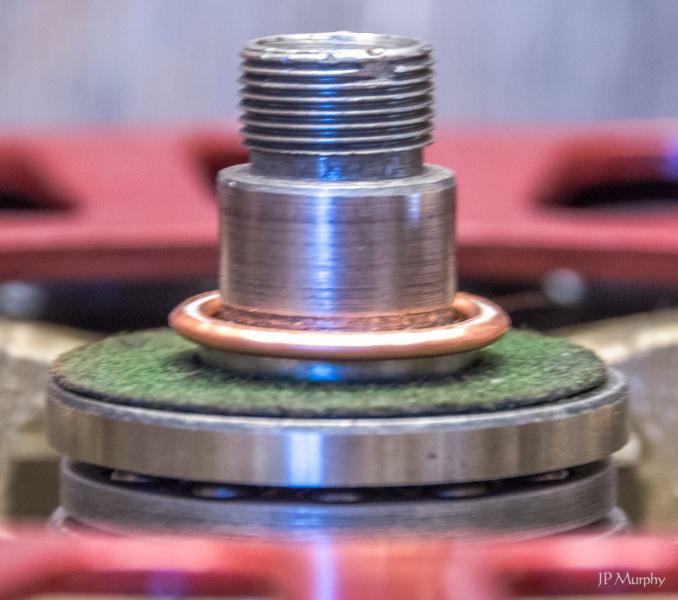 The end rings are normally slightly outside of the stator laminations since they don't do anything to help the motor's magnetic circuit. So, the rotor is probably wider than the stator, and should stick out equally on both sides of the stator, with the rotor resting on the bearings by gravity. If the rotor is only centered in the stator properly when the rotor is touching the top motor housing, there is something wrong. Could the stator be missing a spacer, washers, etc. which is allowing it to sit too deeply in the motor housing? The copper washer is a seal. It will crush slightly and conform to the edge of the shaft and the surface of the inside of the oil cup. 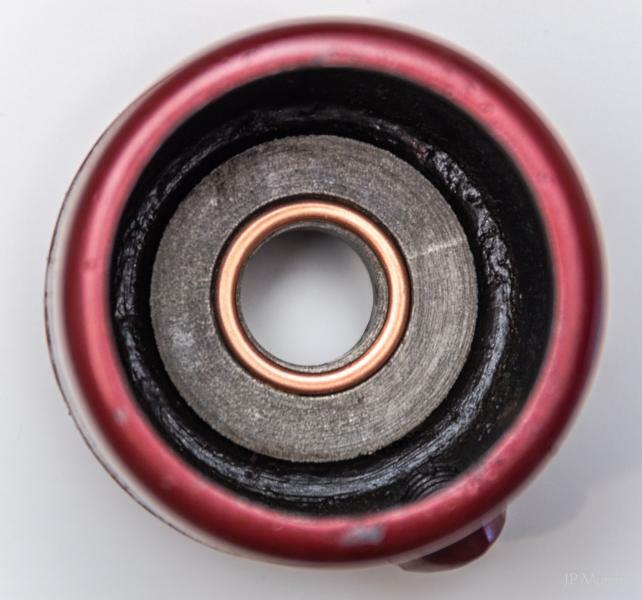 It is necessary, or else the motor will leak oil around the threads and through the bottom of the bearing housing. If it were mine, I would put the original parts back in (as you have) and flip it over on the table. Let gravity bring the parts into their normal running position. Then, look in from the top and bottom, and see how far the rotor protrudes on each side. If it's really off center, then either the shaft is not pressed into the back housing to the correct position, or the stator is not mounted in the back housing at the correct position. Page processed in 0.2003 seconds (34% database + 66% PHP). 30 queries executed.